But if you want to understand what makes Nimblefish some of the best sushi in Portland, watch them make the rice. At Nimblefish, you can eat mackerel that will make you cry. In a compact Hawthorne Boulevard space formerly home to Boxer Sushi, framed by a massive shared table made of old-growth cedar and lighting slung through repurposed barn beams, chefs Cody Auger and Dwight Rosendahl expertly slice some of the most excellent fish you'll ever find in Portland, cured individually for up to 12 days in the ancient Edo style. 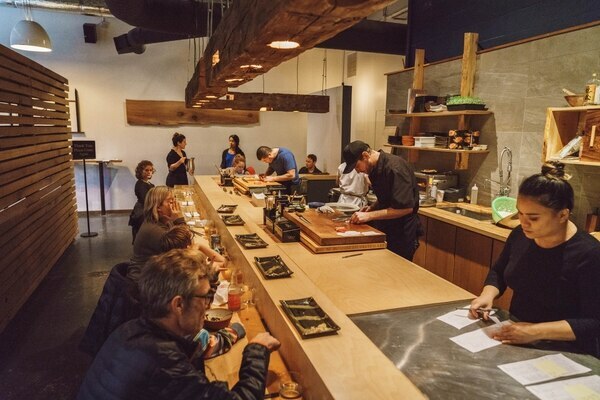 If you order from the tiny fresh menu, which may rotate as many as half its options between visits the same week, it's possible the fish you receive will be a cut rarely seen anywhere in the United States, let alone Portland. On my most recent visit, an uni (sea urchin, $9) grown in the famously frigid waters of Hokkaido was the finest I've eaten outside Japan—bright, crisp and mineral, as if God had distilled the sea to its vital essence and then somehow made it creamy. A previous visit featured a meltingly rich toro fatty tuna ($7) from Tokyo's Tsukiji fish market, not to mention a wildly complex king mackerel cured and aged in-house for days. That second visit also featured a four-deep dish ($9) of Japan's prized katsuo (skipjack) sourced from the southern bay of Kyushi, home to some of the country's most prized seafood. This arrived as skin-on sashimi sliced so thin it was both a diaphanously silky wonder and a tableside demonstration in knife skills, its rich umami accented with herbal mizumi and smacked into brightness by a bright wafu chimichurri. 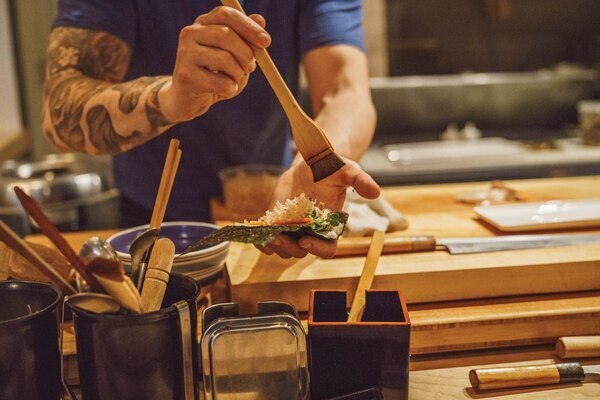 Each bite of nigiri is delivered singly across the blue-pine sushi bar that dominates the space, and each is dressed individually with the house glaze—maybe accented by slivered scallion or mizumi microgreens, with wasabi tucked demurely between fish and rice. Auger's former restaurants Hokusei and Fukami were already some of our favorite meals we've had in Portland. 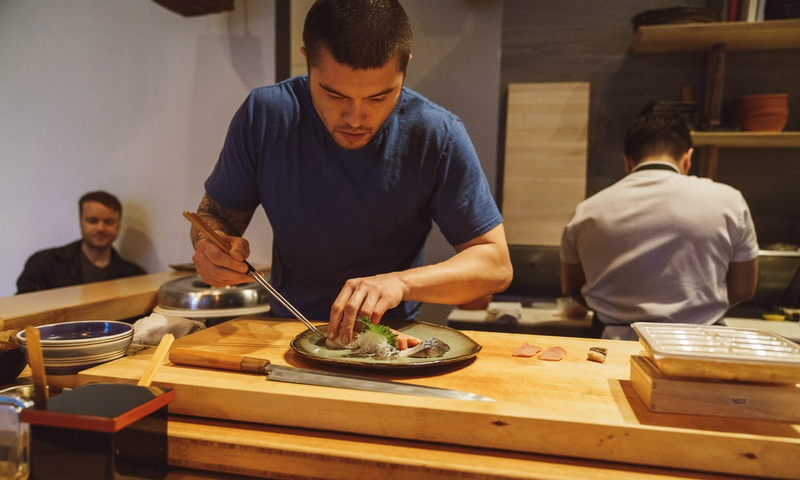 But with Nimblefish, Auger has threaded a difficult needle, merging the techniques of Fukami's bespoke two-day-a-week pop-up menus with the demands of a full-service restaurant. 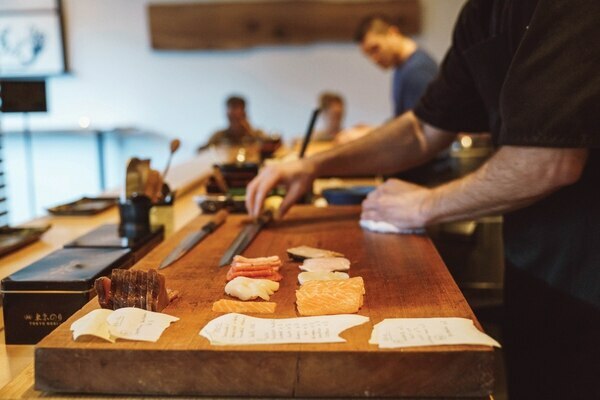 Nimblefish is an exercise in both obsessiveness and restraint, with a pared-down menu attended to with meticulous detail and respect for tradition. Auger and Rosendahl serve four things and four things only: nigiri (fish on rice), the occasional sashimi (fish with no rice), chirashi (fish in a rice bowl) and cigar-sized temaki handrolls containing fish, rice and pickled veg—with ingredients ranging from impossibly funky fermented-soy negi to toro to bright pickled plum. 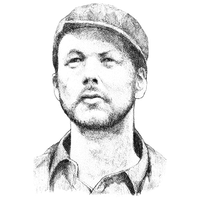 The fish is, of course, the star at Nimblefish—routine in its excellence, with all but the salmon and amberjack caught wild. But if you really want to understand what makes Nimblefish the best day-in, day-out sushi restaurant in Portland, watch Auger make the rice. Three times a night, Auger spreads out Tamanishiki rice—containing some of the most exquisite and sought-after sushi rice available in America—across a 3-foot-wide cypress bowl called a hangiri to cool it to body temperature. He then swipes his seasoned vinegar mix across the rice in a sweeping motion and "cuts" the rice with a paddle. Very few others in town use the traditional, very expensive hangiri, but it is essential. Not only does the rice's moisture breathe better into the porous wood than metal or plastic alternatives, but the six-year-seasoned bowl also imparts its particular flavor to the rice. The result is some of the most wondrous rice in Portland—glutinously sticky and chewy, with a depth almost unparalleled in Portland. It shines best in the chirashi rice bowl ($28), which also includes pretty much every piece of fish advertised on the standard nigiri menu, from tender boiled octopus to smoked sake. When you dig beneath to the rice, the bowl becomes near-symphonic in its pleasures. I could eat a bowl of that rice, topped with nothing, and be happier than with most salmon plates served in Portland. 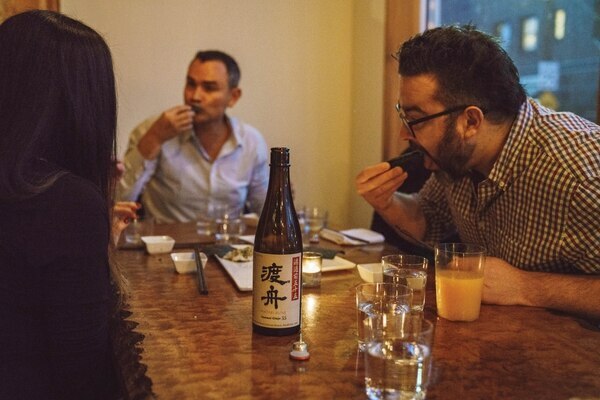 The sake glass menu is small but tightly curated, notably featuring a rarely seen kimoto sake—an ancient, funky and yeast-forward style made by laboriously churning the sake like it's butter. 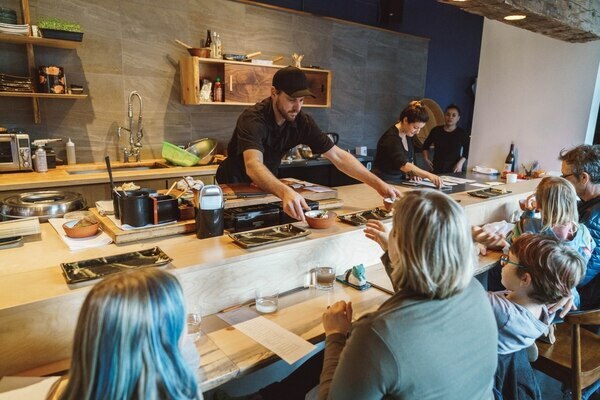 But think very hard about pairing your sushi with wine instead, on a list curated by Davenport's Kurt Heilemann, also a co-owner at Nimblefish. Heilemann has one of the best wine-pairing palates in town, and the $10 house selections of Crémant de Bourgogne and muscadet are mineral and complex, uncommonly wonderful pairings for sushi. Those wines also offer the best price-to-deliciousness ratio on the drink menu, which also includes a rare Japanese schwarzbier and a wealth of Japanese whisky. Of the menu's main components, the cigar-sized, single-serving handrolls are a weaker link; though they remain very good, they're much more diffuse as a vehicle for those truly excellent ingredients. Your meal also won't come cheap. Even if you keep yourself to a few rare nigiri off the seasonal menu, split a chirashi bowl and order a couple handrolls, your bill per person might still top $50 before tips and drink. It will also be worth it. But those will probably iron out over time: What will almost certainly remain is the deft and attentive artistry paid to even the smallest details. Even the tamago egg nigiri—often outsourced by many midrange sushi spots—is here a euphoric experience. It is, in fact, the best I've had in Portland—delicate, sweet squares of egg brined in housemade dashi and seasoned with soy, sugar, salt and sweet sake. That tamago should be the final bite of every meal. Though a humble square of egg, it's as rich and airy as the loveliest of French confections. Go: Nimblefish, 1524 SE 20th Ave., 503-719-4064, nimblefishpdx.com. 5-10 pm Tuesday-Saturday.